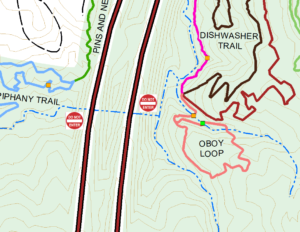 With the closure of the ‘OBoy tunnel’, the far end of the the Fall Quarry Run Trail has been renamed to ‘OBoy Loop’. The trail sign is the 4 way intersection between Dishwasher Trail, Fall Quarry Run Trail, Monolith Trail, and OBoy Loop. There are some plans in the works to add and alter some of the existing trail to create a full loop. A trail maintenance event will be scheduled and added to the calendar in the coming weeks.